Navigating with SPD - Family Times is an award-winning magazine with staff-written news, feature stories and artwork that inform and inspire Central New York parents and their children. When people look at Caryn Daher’s “going on 7-year-old” son, Jonathan, he seems much like any other little boy his age. They don’t realize that it sometimes takes a lot of effort for Jonathan to complete everyday tasks because he has a condition known as sensory processing disorder, or SPD. The human brain interprets countless messages from the nervous system each minute—a process that results in a particular physical, emotional or behavioral response. But for young people like Jonathan, this process is disrupted, making it difficult for them to elicit appropriate responses. Daher, who lives in Clay with Jonathan and her husband, Francis, says it can be difficult for parents to tell if something is wrong with a child’s sensory processing. Some kids may be slow to show progress in developing motor skills; others may seem to not feel pain. Still others are misdiagnosed as having attention deficit hyperactivity disorder (ADHD). To help other families facing the same concerns, Daher, with Michele Hawthorne, founded CNY SPD Parent-Connections, a local chapter of the Sensory Processing Disorder Foundation. Daher’s son was 2 1/2 when a speech therapist suggested that he might have some sensory challenges. Looking back, Daher says there were hints that Jonathan was struggling. Listening therapy, which included using classical music to slowly build tolerance to tones and dynamics, helped. The Dahers also established a collaborative relationship with staff, administrators and resources available through her son’s school, St. Margaret’s in Mattydale. Jonathan is now doing well in his second-grade classroom, and a written outline of modifications for him—called a 504 plan—enables him to have the classroom supports he needs. While Jonathan was getting the help he needed, Daher and Francis—owner of the American Collectibles Exchange in Cicero—still wanted to connect with other families facing similar issues. “We were looking for support for ourselves because we needed to talk with parents who were going through the same things,” she says. So in 2009, Daher, a loan processor at Territory Mortgage in Baldwinsville, started CNY SPD Parent-Connections with Hawthorne (who no longer leads the group). The group meets every month at the Beacon Baptist Church in Clay, and holds a monthly Sensory Friendly Time for children at the Museum of Science and Technology (MOST) in Syracuse. Daher says the group has offered parents information on issues such as occupational therapy, physical therapy, alternative medicine, chiropractics, agency-based services and social programs. She frequently spends hours on the phone with other parents, helping them navigate the road to assistance—or just listening. Additionally, the group supports the goal of the national SPD Foundation to get sensory processing disorder recognized as a stand-alone disorder in the Diagnostic and Statistical Manual of Mental Disorders (DSM), published by the American Psychiatric Association. Daher says this would help more children get support services. The most common question Daher hears from parents is: “How can I get the school to do more?” She explains that many children like Jonathan qualify for early intervention services through Onondaga County as babies or toddlers, but lose access to support services once they start school. 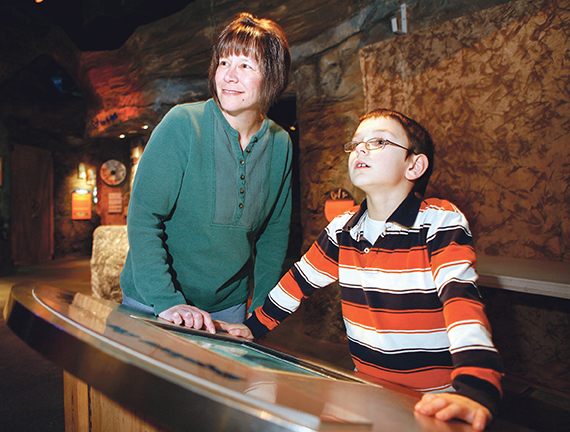 By working with therapists specializing in sensory processing disorder, staffers at the MOST have succeeded in offering children with SPD the opportunity to enjoy the museum for Sensory Friendly Times. The monthly event was launched with the help of MOST educator Betty Jones in response to an inquiry from a parent of a child with SPD. Daher says programs like this are helpful because they take the child and parent out of their comfort zones—something, she admits, that must occur if children with SPD are to adjust to life outside their homes. Daher recalls being scared to leave Jonathan alone in the yard, because he would take risks without understanding the consequences. “My son was curious—without that self-regulation. We couldn’t leave him alone, so we were pretty tired for the first four years,” she says with a laugh. Today, most everything about Jonathan’s life has to be regulated, but he is now better able to explain his anxieties and communicate how he feels when his senses are overloading him. Karate has helped improve his focus; Jonathan trains at Five Star Martial Arts in North Syracuse, where Daher works part time as an assistant program director. And thanks in part to her work with CNY SPD Parent-Connections, Daher has learned to start stepping back and letting Jonathan take charge of how he handles his responses.